In the last guide post, I talked about how to choose a niche site theme and plugins. Today, I want to talk about the really hard stuff… creating quality content for your readers. By now, you have done your research, chosen a domain, created a site on a webhost and installed wordpress. You have looked at theme options and put all the plugins that you want on the site, but now the job gets difficult. You need to create content that people are going to be reading, and it needs to be really good content. The reason it needs to be good, is because if people don’t like your content, they won’t read it, spend time with it, link to it, or tell others about it. The reason you want people to do all those things is because it will increase your traffic levels and most importantly your trust level with your readers. If you have crappy content, why on earth would anyone want to click on one of your links? Why should they use a product that you recommend? When was the last time you bought something from a company you didn’t believe in? Content Length – According to Neil Patel, sites with more words tend to get better rankings. He has a really nice graph which I am going to borrow (Thanks Neil!) that demonstrates this below. 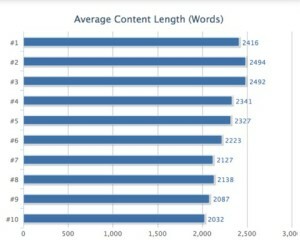 Based on this, the goal is to put out posts with 2,000 words or more. Personally, I don’t like to keep my posts that long because I am afraid of losing my audience. To me, it is much more important that your posts are great, rather than just meeting a serp length requirement. Seth Godin does a great job of providing meaty posts that are still quite short. That said, the chart below is something to consider. Keyword Density – I know that there are many people out there that say this doesn’t matter at all. I have also noticed that these are the same people who run MEGA authority sites… and quite frankly they don’t need to worry about this. As a niche site builder, it is critical that you utilize your target keywords in your content because you are trying to get the best ranking position you can with only 15 posts. For that reason, I recommend that you use your keyword about 3-4 times in a post which is 500-1000 words long. I also suggest you sprinkle some secondary keywords to target in there, and make sure you are paying attention to LSI (see below for what that means). Latent Semantic Indexing – Go ahead and click the link to your left to get a full rundown of what this means. Basically, it means that you need to be speaking the language of your readers. If you are talking about the internet for example, you can’t just keep calling it the internet all the time. You need to use words like the web, and the net for example. Try to use the slang of your audience when possible. It shows that you truly understand your community, and it helps the search engines to establish you as an authority. Duplicate Content – I shouldn’t even have to mention this, but I will anyway. This is a huge no-no. Never, and I mean never, use content that has been used elsewhere. If you write a guest post on someone else’s site… it is their content! It is not cool to use it on your site too. Google will also slap you heavily for this, so it is a no brainer. Spelling and Punctuation – I ain’t no english teacher :), but I know that people don’t want to read anything that seems like it was written by a six year old. You don’t need to be perfect, but your writing needs to maintain a flow. People that are educated will actually stop reading and make “corrections” in their heads when they see spelling errors or grammar issues. If you use too many commas, or periods, that is “ok” in my opinion, because my punctuation is less than perfect… but the content you create needs to be good enough to keep people reading to the next sentence. If a reader sees 15 spelling errors in the first 5 sentences, I can assure you they will leave. Reading Level – While you don’t want to seem like a 6 year old writer, you also don’t want to write using words that people need to a dictionary or thesaurus to figure out. As a sales guy, my motto was always “big words are for crossword puzzles” when trying to make a pitch to a prospect. I found that if I used words that people didn’t understand, it made them uncomfortable. The whole point of a sales person is to gain trust and comfort. If your reader isn’t comfortable reading your content because it makes them feel stupid, then they won’t keep coming back. This does not mean dumbing it down to the point that you are writing for children (unless that is your niche), it just means try to write for a target audience. Numbered Lists – You can use either numbered lists or bullet points, but often times the best way to get your message across is to allow readers to skim through your content. I wrote here about how 40% of your content won’t ever be read. Using a numbered list or bullet point list allows your reader to quickly scroll through your post looking for things they want, and hopefully take in more of your content. Outbound Links – You are not a god. You are most certainly not the only person that is an expert on your content. Most of us are afraid to link to other content because we are worried that the reader will never come back. I have news for you, having outbound links to authority sites isn’t only great for SEO, it is also great for bringing in traffic. Search engines love to see you linking to relevant and authoritative websites. The owners of the websites also love those links, and often times will visit your site to see what the link is all about. Sometimes, they will link to your website to show their own audience that they were linked to in a post, helping them establish credibility with their readers. Most importantly, your goal is to provide the best possible content you can to your audience, and linking to other great content is the best way to do that. I will show you how I do it in my next Niche Site Guide post about link building. I know there is plenty more that can be written about creating great content, but I wanted to give you the basics that are necessary in my opinion to get started. Once you have created 15 posts using the basics listed above, you will have a better grasp of the direction you want to go in with your content creation. What tips do you have for other readers? What has worked best for you to create amazing content? Leave a comment below.